On Thursday, it was announced that Predators goaltending stalwart Pekka Rinne would miss at least 4 weeks with a spontaneous bacterial infection in his hip that he had surgically repaired this offseason. With Rinne out for a month, 27-year old Carter Hutton, who has appeared in 2 games this year with the Predators, will get his first significant shot as a starter in the NHL. Is Carter Hutton Ready to be a Starter? When the discussion turns to goaltenders that have Stanley Cup rings, it usually focuses on whether or not they’ll be able to maintain their level of play after making it through 4 grueling playoff rounds. What is usually not discussed, it what will happen as they look to start for just the 3rd time in their NHL career. While starting one regular season with the 2012-2013 Chicago Blackhawks and acting as backup while Ray Emery was injured, including during the first five playoff games, Hutton had plenty of experience taking shots from players like Jonathan Toews, Patrick Kane, and Duncan Keith during practices. Although Hutton was given a Stanley Cup ring after the Blackhawks would go on to win in the Finals, he not only failed to get his name on the Stanley Cup, but was left out of the official team photo, as well. While with the Predators, Carter Hutton has seen action twice already in this young season, with one win in one start, one appearance after Rinne was pulled, and two goals total against this year. In his two appearances this year, Hutton has put up pretty stunning numbers, including a Save Percentage of .967 and a Goals Against Average of 1.09. After beating out Magnus Hellberg for the backup goalie spot during training camp, Predators Coach Barry Trotz believed that Hutton has earned his shot with the team. With Rinne going down, Trotz will not have much choice but to trust Hutton with the keys to the team. If Hutton falters after a few games, it would not come as a surprise to many to see Hellberg aching to get a chance at a start. 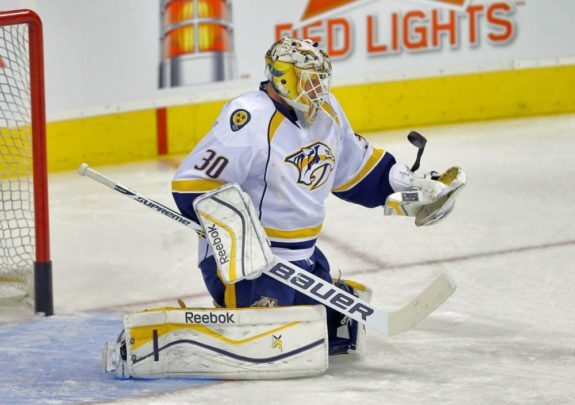 Could Rinne Lose the Starting Job on his Return? Even though that question sounds unbelievably absurd to any Predators fan, as well as fans across the league, it’s never out of the question. While most sports fans are well aware of New England Patriot’s Quarterback Tom Brady’s ascent to the starter job, after longtime starter Drew Bledsoe was injured, the same happens relatively often in hockey as well. 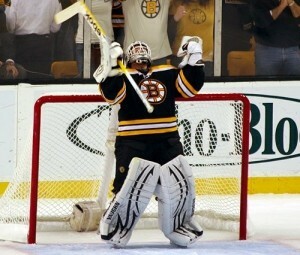 One of the best examples in the NHL of this also took place in the Northeast, when Andrew Raycroft and Hannu Toivonen were injured, the Boston Bruins handed the reins to a journeyman goaltender, named Tim Thomas, who had never stuck anywhere other than the minor and international leagues. Thomas shined in his stint with the Bruins, won the starting job, and would go on to eventually win the Stanley Cup with them. While stories like Tim Thomas’s are generally rare in the NHL, as most backups tend to now be more experience veterans, with the starting goaltenders younger, it will be possible for Hutton to prove that he has a place with the team. Although Pekka Rinne hasn’t exactly set the league ablaze with stellar goaltending to start the season, he has been largely responsible for weathering a storm of opposing offenses, while the defense has been adjusting to an influx of players. If Hutton starts most of the 12 games on the schedule for the next four weeks and catches fire, Trotz could stick with the hot hand in net, much like the Penguins did with Patrick Lalime. The NHL regular season schedule was released on Friday. Check out our partners at TiqIQ for the best deals on Nashville Predators tickets for all 2013-14 games.